The automaton constrained tree knapsack problem is a variant of the knapsack problem in which the items are associated with the vertices of the tree, and we can select a subset of items that is accepted by a tree automaton. If the capacities or the profits of items are integers, it can be solved in pseudo-polynomial time by the dynamic programming algorithm. However, this algorithm has a quadratic pseudo-polynomial factor in its complexity because of the max-plus convolution. 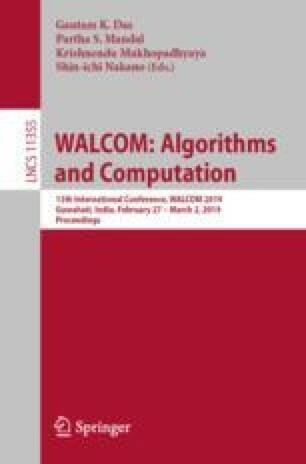 In this study, we propose a new dynamic programming technique, called heavy-light recursive dynamic programming, to obtain algorithms having linear pseudo-polynomial factors in the complexity. Such algorithms can be used for solving the problems with polynomially small capacities/profits efficiently, and used for deriving efficient fully polynomial-time approximation schemes. We also consider the k-subtree version problem that finds k disjoint subtrees and a solution in each subtree that maximizes total profit under a budget constraint. We show that this problem can be solved in almost the same complexity as the original problem. We thank the anonymous reviewers for their helpful comments.